Canadian pilots flew with great distinction in the First and Second World Wars and the Cold War. 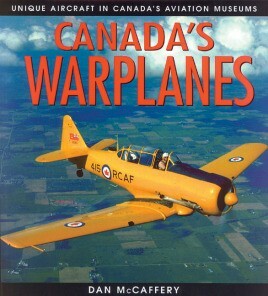 This book focuses on 24 outstanding warplanes flown in those conflicts by Canadians. Canada's Warplanes is a visually rich book chronicling the exciting careers of 24 outstanding aircraft piloted by Canadians in the First and Second World Wars and in the Cold War. Dan McCaffery highlights a diverse spectrum of aircraft from First World War biplanes such as the SPAD VII and the Sopwith Camel, to Second World War classics such as the Spitfire and Lancaster. Also included are famous Commonwealth trainers such as the Harvard and Tiger Moth, and sleek Cold War jet aircraft such as the CF-104 Starfighter. Eyewitness accounts of dramatic actions bring each of the warplanes to life. Aircraft are profiled individually, accompanied by historic and contemporary visuals and colour artwork. The book includes profiles of Canadian aviation museums, a brief glossary and a list of related reading. Packed with exciting colour visuals, Canada's Warplanes is a fascinating introduction to this country's military aviation heritage.